Iggy Azalea is quelling rumors that another NBA star is smashing her surgically enhanced cakes. This time the baller in question is Jimmy Butler. After Iggy Azalea was spotted with NBA star Jimmy Butler in Malibu over the weekend, some speculated the two were an item. But, Iggy says that ain’t it — the two just happened to be “standing next to” each other in a restaurant parking lot. 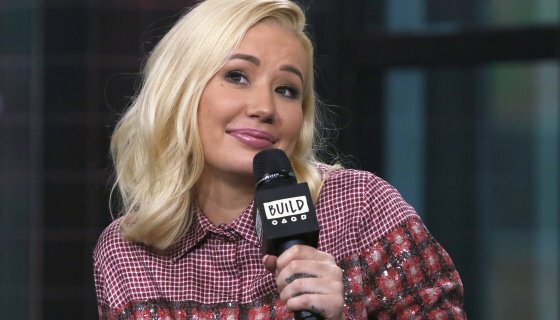 “Can we please stop saying every man who is single you see me standing next to is someone I’m on a date with,” Iggy said. Iggy insist the two were simply having “normal in passing conversation” — not finishing up a date, as the photo agency who shot the pics suggested. So what’s she’s saying is they’re not dating, yet? In semi-related news, Dwyane Wade offered Jimmy Buckets the fade while DeAndre Hopkins was also wrongly-linked (or maybe not) to Iggy.